Where are the beaches? Mom says we are not going to the beach. 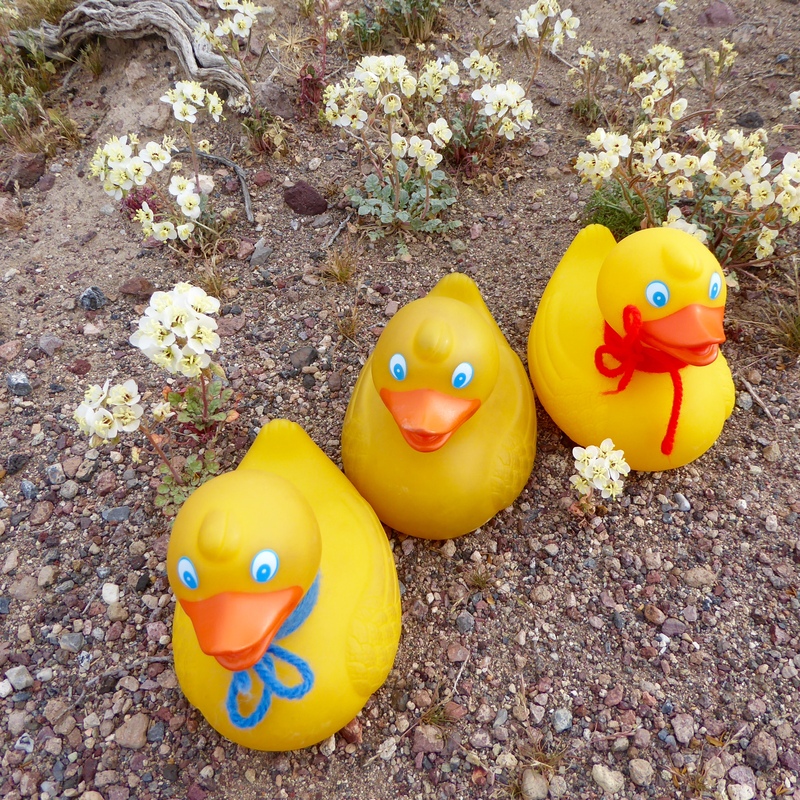 The desert is in bloom. That means there are wildflowers blooming where usually no flowers bloom. 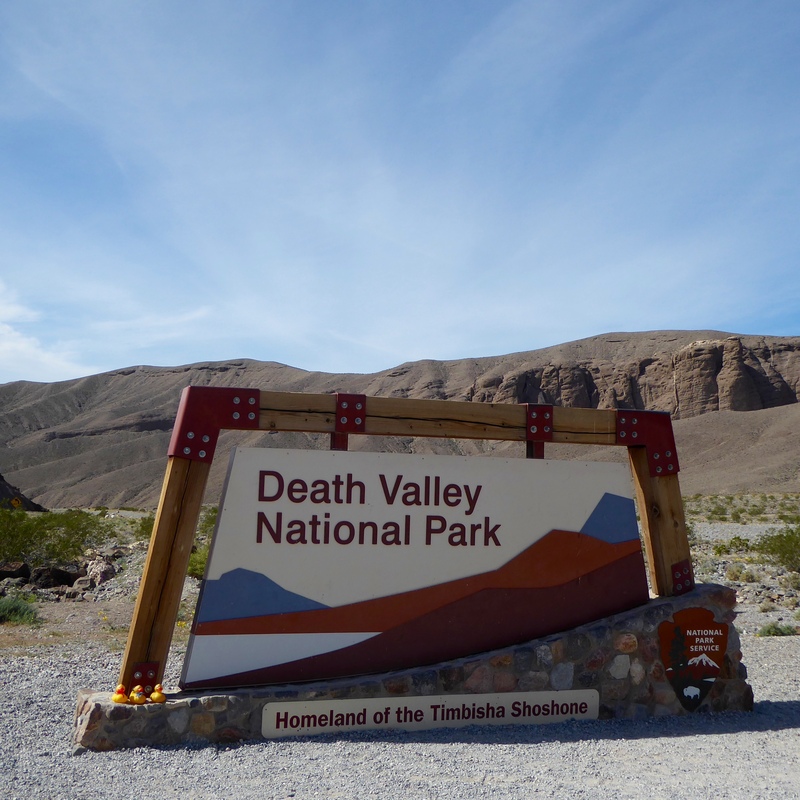 Entering Death Valley National Park, we will look for wildflowers. 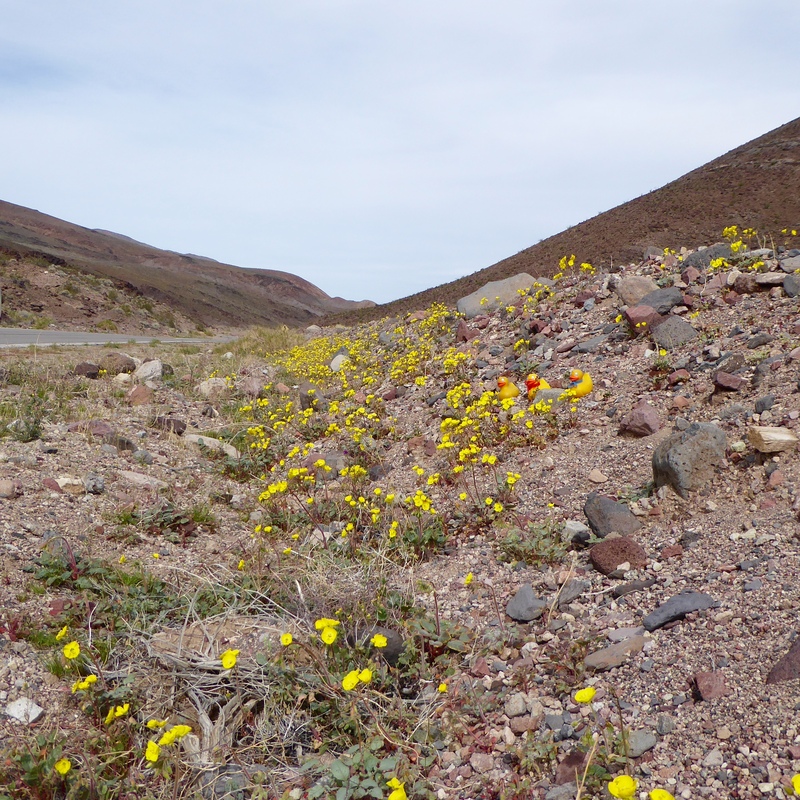 This desert usually receives 2 inches of rain annually and summer temperatures over 120 degrees are normal. Here are a few flowers. We like purple, and of course yellow is one of our favorite colors. These white flowers are pretty, also. And the flowers are growing in gravel like soil. Mom buys potting soil for our flowers and needs to water every few days. The flowers are beautiful this year, but mom did not get very good photos. Looking online you will see better views of flowers. 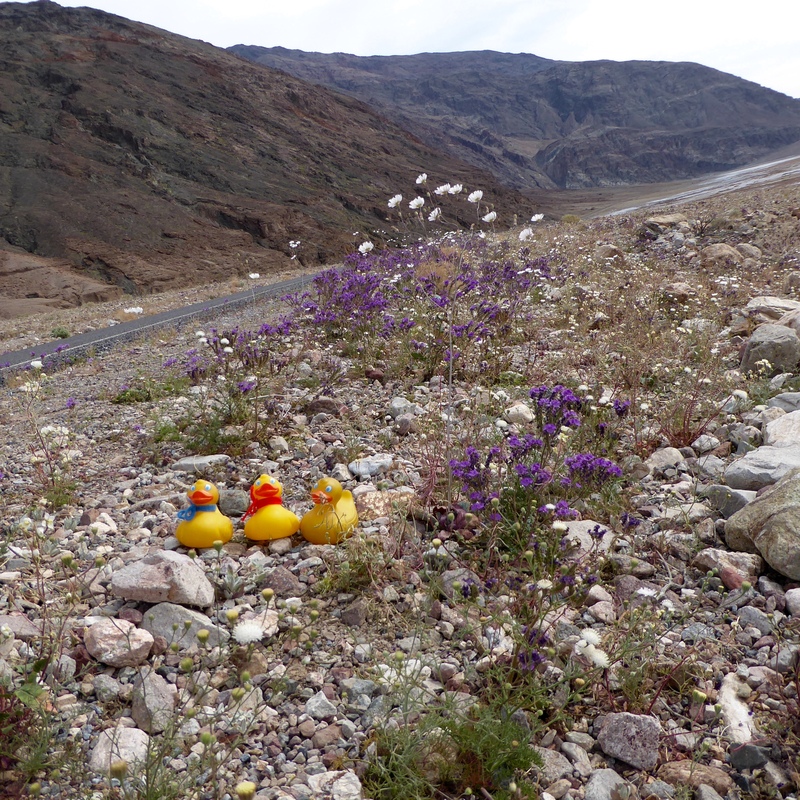 A fellow traveler we met at dinner one evening, suggested we take Artists Drive to see flowers. We did, and also went to Artists Palette. Artists Palette shows colors of the mountains. Over 5 million years ago repeated volcanic eruptions blanketed the landscape, depositing ash and minerals. The volcanic minerals were chemically altered by heat and water, with variable amounts of oxygen and other introduced elements. Chemical analysis have identified iron, aluminum,magnesium and titanium,but no copper. Some of the colored minerals here include red hematite and green chlorite. We love the information signs in national parks. 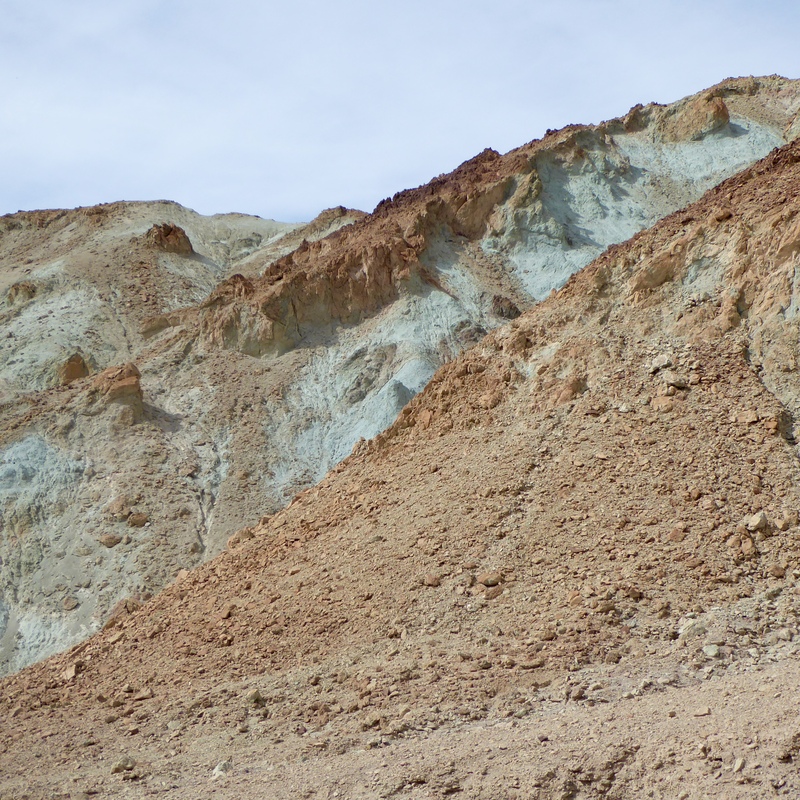 Further along Artists Drive, we admired this splash of turquoise mountain. Color of Caribbean in rocks here. Just like huge turquoise wave in the Caribbean Sea. Here are a few more of this years wildflowers. This bush is even producing small yellow flowers. We especially liked these flowers. Wildflowers really are growing wild this year. 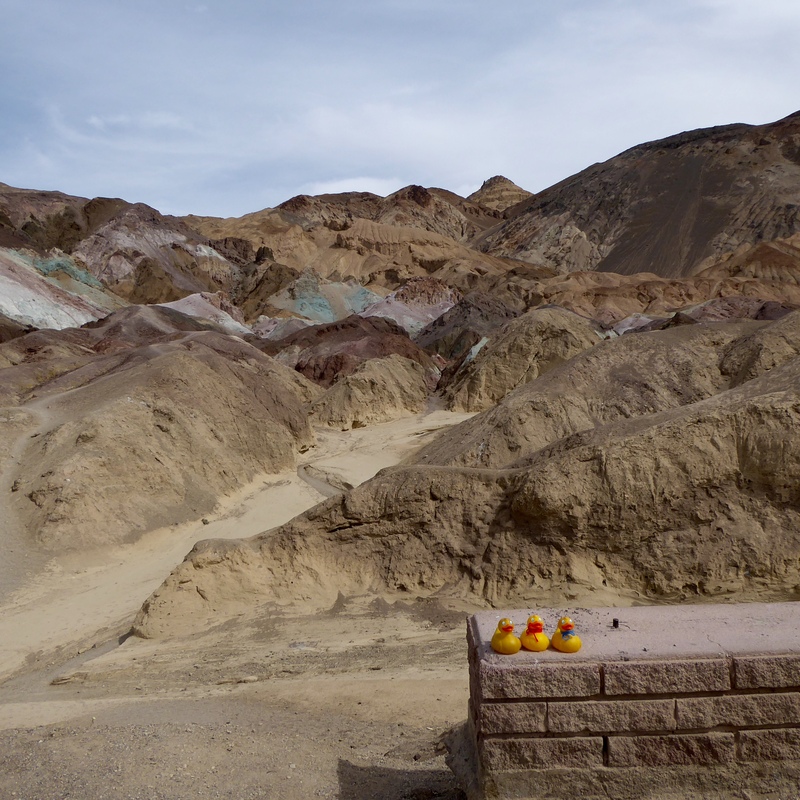 This was our first time in Death Valley. We were fascinated by the entire landscape and we will show you more next time. 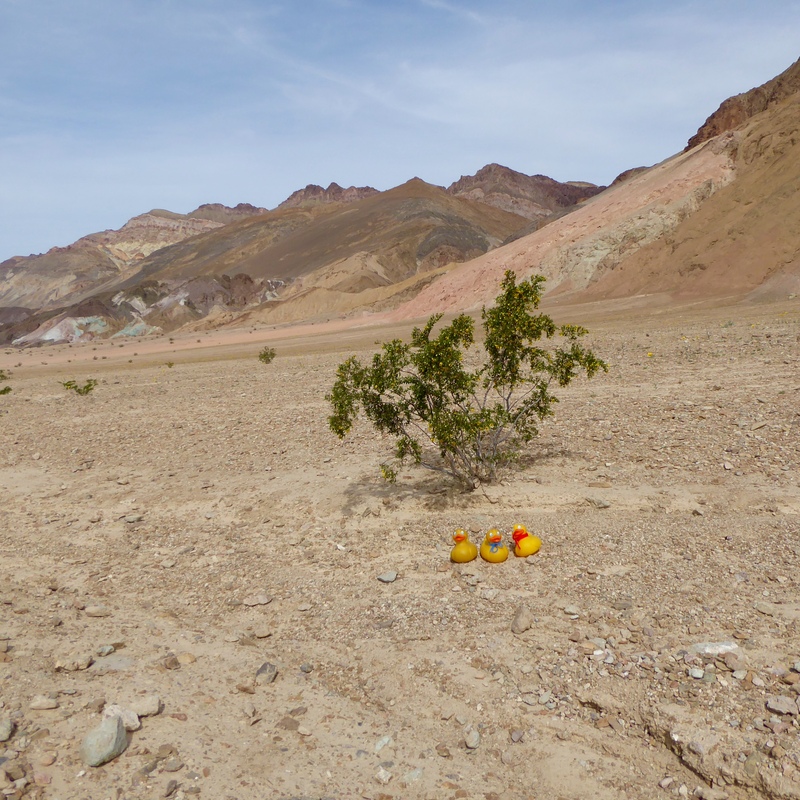 You should see Death Valley soon. You will like it also. 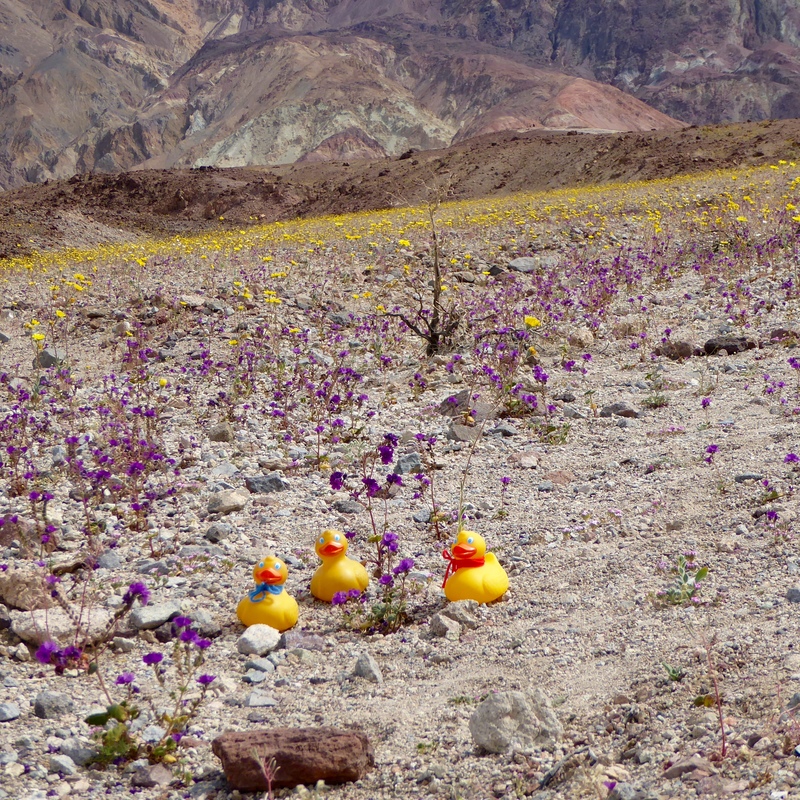 This entry was posted in California, Uncategorized and tagged Artists Drive, Artists Palette, California, Colorado Traveling Ducks, Death Valley National Park, wildflowers. Bookmark the permalink. I was surprised to read that the green is not copper. 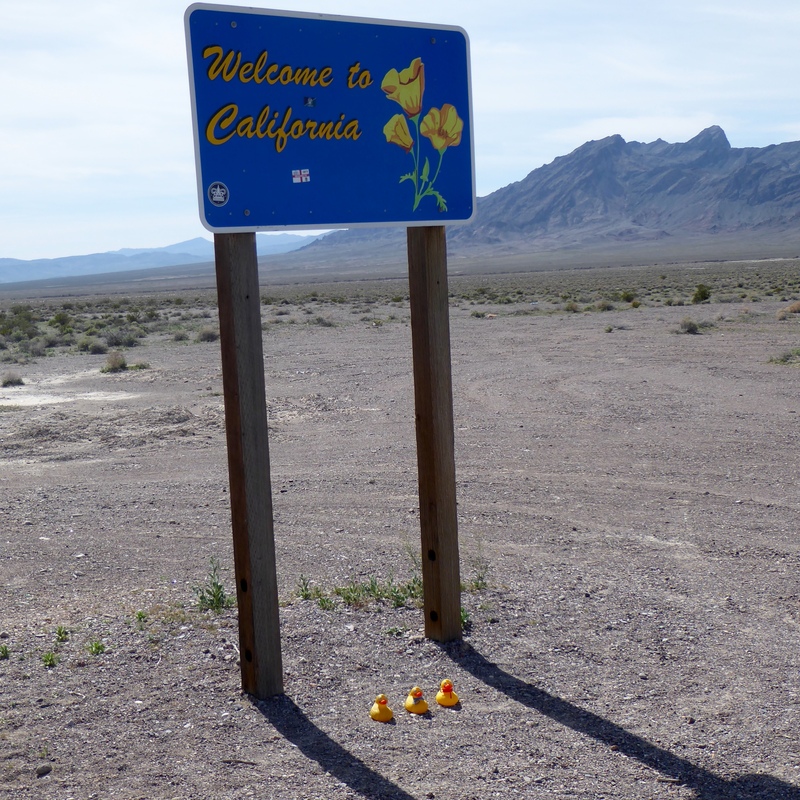 Very interesting post Ducks. 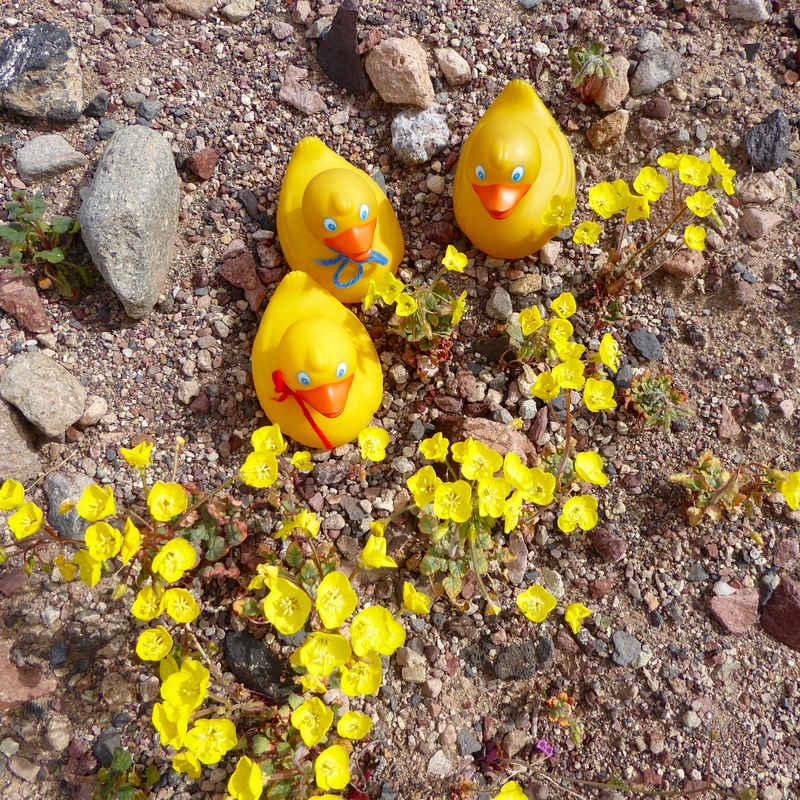 You are well camouflaged in those yellow flowers. I am not sure what is causing the various colors. Nothing that I expected. Really love the turquoise but again, not sure what caused that color. 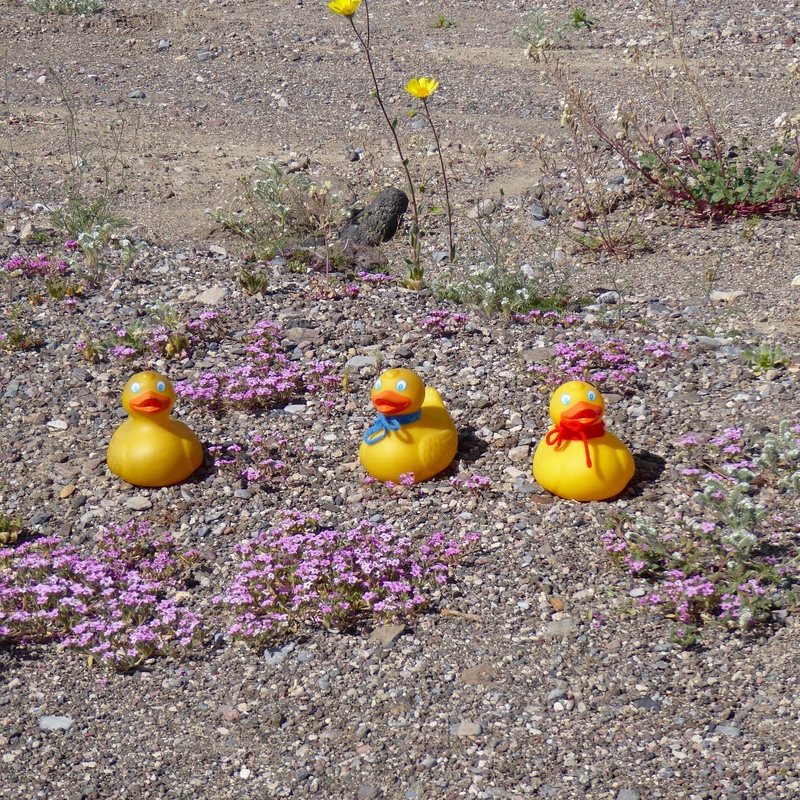 Ducks do blend with wildflowers. Entire area was beautiful. Thanks for reading and commenting.